The woman who wrote this book is crazy town. Okay - let's back up a minute. I'll say some nice things about this book first. Some of Wissner-Gross's advice is quite good. I think she understands a fine line between angrily demanding in an entitled fashion (a common mistake) and earnestly inquiring how to help your student excel. She does a great job of explaining why colleges don't want well-rounded students - a kid with a single overriding passion or with two different but very intriguing interests is better than an applicant with a smattering of everything. She does a great job of explaining that what high schools and colleges want doesn't always line up with what's best for your child. She shares a great example of how to ensure that your children get good grades. Say you come from a nice middle class, or upper-middle class family. You've carefully chosen a good high school and reasonably challenging classes for your kids. Chances are, nearly all the kids in a "good" high school from well-to-do, caring families are perfectly capable of getting an A in an AP level course. Why? The sample size is small, and the group of kids is already skewed to being more successful. But it will look "odd" if the teacher gives out an A to every single kid in class. So, pretty early on, consciously or subconsciously, the teacher will start looking around to decide who to give a B or even a C or D to. Promptly addressing any grade concerns can prevent your kid from being the chump who gets stuck with a B, when they could have just as easily gotten an A.
I really liked Wissner-Gross's idea of taking the day before SATs and celebrating it as a family holiday - "Cram Day" as those few extra points on the test could mean the difference between admittance or being wait listed. I liked her point about how parents should never roll their eyes and agree with anyone who complains about their teens. To the rest of the world, the family should provide a united front. Not a bad idea. However! Whenever Wisnner-Gross talks about her sons, she becomes braggy, obnoxious and strange. She maneuvered to get them into the New York Opera - not so much because they had an actual interest in music but rather because she thought it would make them "interesting" to college admissions boards and their auditions at Lincoln Center might make for good college essay material. Both boys eventually got into Harvard. For me, where she really falls down is when she tries to make the case for why helicopter parenting is a good idea. All the other parents are doing it. Kids these days seem okay with it. You really should give your child every advantage - and yes, that means, never ever letting them fail. Rifling through your child's backpack. Scheduling every free minute of their time with impressive sounding activities. Prepping for the SAT starting in 7th grade. All of this seemed to go too far to me. The author seemed to have very little thought or concern about the child's overall happiness or their ability to succeed as an independent adult. The book was written nearly 10 years ago, and feels a tiny bit stale. It's written to a Boomer audience who aren't comfortable with computers. Her advice about creating neat looking college applications by physically cutting and gluing typed responses onto a page, or hunting down an old-fashioned typewriter, and her enthusiasm for sending faxes vs. e-mail seemed rather dinosaur-ish to me. Overall, this is a quick read. 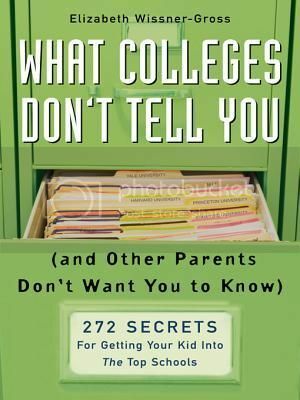 Nervous parents looking for college application advice for their teens should cherry-pick some of her best ideas, and ignore or modify the rest. Well, I must say it was a bit of a surprise to read a review of book like this on your blog. Interesting, though. As a non-parent myself, but as someone for whom the high school and college experience is relatively fresh in my memory, I'm constantly agape and the difference of parenting habits between then and now. Yeah, it's like night and day. When I went to college, it seemed most parents were just dealing with the sticker shock - it was right when college first started getting outrageously expensive. The whole idea of gaming the system barely existed then.